Tile is more expensive than paint, so the amount of material and the complexity of your design will likely depend on budget. Options range from minimal use in a border, for example, to maximum use in floor-to-ceiling executions. And each implementation, of course, can be done in different materials, be it in a classic subway tile or multicoloured mosaics. It’s good to think about resale value when making changes to a bathroom, especially because white and off-white are the most popular colour schemes in that room. That said, your bathroom is a space that all of your guests will likely see at some point; so if you want to make a statement, this is the place to do it. Think about it the same way you would your kitchen backsplash: You want it to be timeless and clean, and to not turn off potential buyers. You could allow tile to make a statement and cover all four walls, or use it to create pseudo-wainscoting and paint the top half of the wall the colour of your choice. Here are five general bathroom tile ideas to apply to your space. Wainscoting is a decorative wall covering that extends partway up the wall. It’s typically done in wood and in spaces such as the dining room. However, it can also work in the bathroom as a way to add character. If you want to incorporate tile but are on a budget, try tiling from the floor up and then paint the remaining wall with a gloss or semi-gloss paint for easy clean-up. A potential benefit of using tile wainscoting is that it can also work as a backsplash if it extends high enough above the sink. 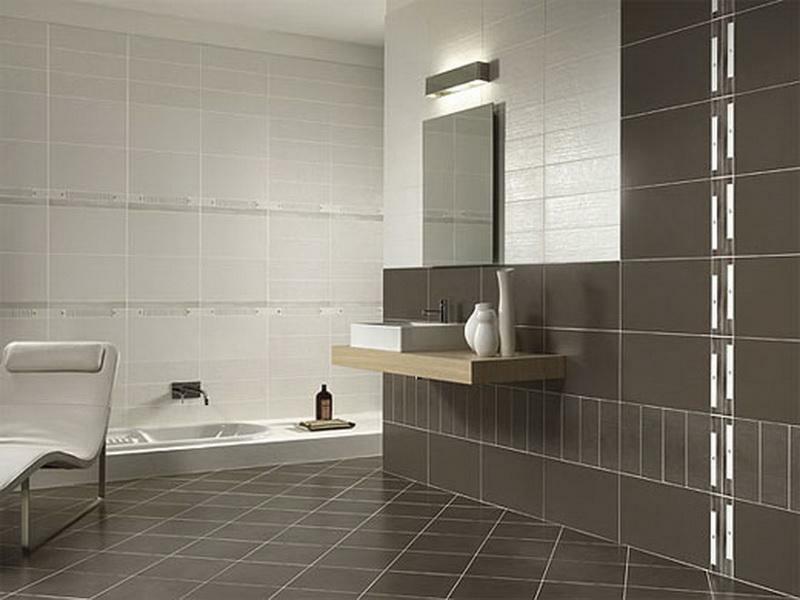 A border of tile lets you add your personal style without breaking your budget. It also can be a way to make a bold statement without making a huge investment (and also one that can be changed to match the taste of future buyers). Add a strip of mosaic tile or colored glass along the top of subway-tile wainscoting or let it stand alone against a painted wall to warm up the room. Tile flooring is common in bathrooms and offers a nice alternative to hardwoods, which can get warped if they are exposed to too much water. If you decide to put ceramic tile on the floor, look for a grade of 1 or 2, a water-absorption rating of less than 7 percent and a coefficient of friction above .60, which are slip-resistant and can stand up to water. Also pay attention to porosity; you’ll want a more impervious tile for the floor because of exposure to water. Vinyl feels better on bare feet than ceramic tile, and it’s one of the more popular flooring choices as it’s inexpensive and practical (safe, easy to install and maintain). Define zones in the room by using a different tile in the shower. You’ll want to use a tile that has a water-absorption rating of less than 3 percent (lower than what’s recommended for the floors) and has good traction (a coefficient of friction that’s greater than or equal to .60). If budget isn’t a factor, then all-over tile can be an interesting way to merge durability and easy cleaning with style. Vary the color, shape, pattern, size and texture of tiles by using different materials on the floors, on the walls and in the shower. Using all-over tile is a good way to make a small space brighter, as the tile will reflect light. I like how you mentioned that tile flooring does better in bathrooms than hardwood does. My husband and I are going to be remodeling our bathroom, and we’re trying to decide what kind of floor we want. I imagine that it would be easier to pick something that is water resistant, so perhaps we could install tile.